Learn 5 simple ways to use lavender essential oil for relaxation and stress-relief! Lavender is a calming and versatile and is a great entry point for essential oils! I love lavender. It's my all-time favorite essential oil! Not only because it smells amazing, but because it's super relaxing. 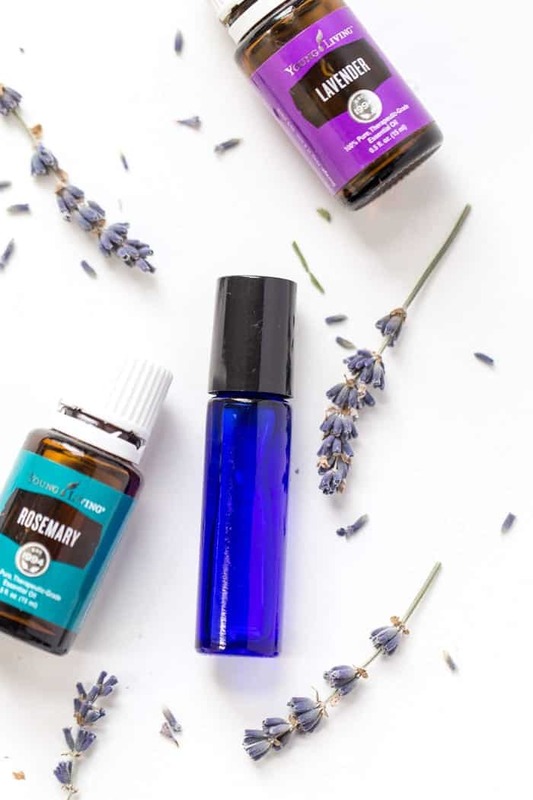 Lavender essential oil has become part of my daily (and nightly) routine and I love how many ways there are to use it. Why is lavender great and what can we use it for? Here's why lavender rocks! So yes, it's great for night AND for during the day. 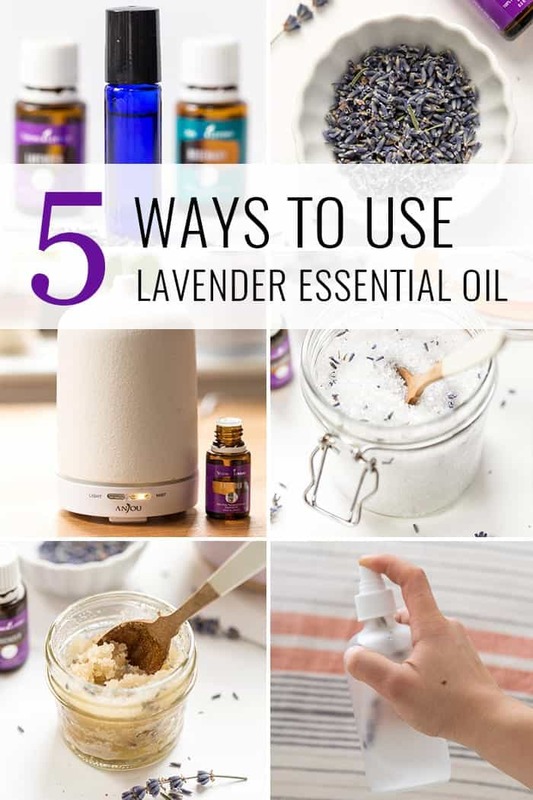 In this post, I'm going to share 5 simple ways to use lavender essential oil! The easiest and probably most common way of using essential oils is to diffuse them using either an aroma diffuser or a tea light diffuser. The process of diffusing is simple; you add some oils into a water and then either through heat (with the candle) or the machine, the oils mix with vapor and get diffused into the air. Personally, the oil I diffuse every single day is lavender. 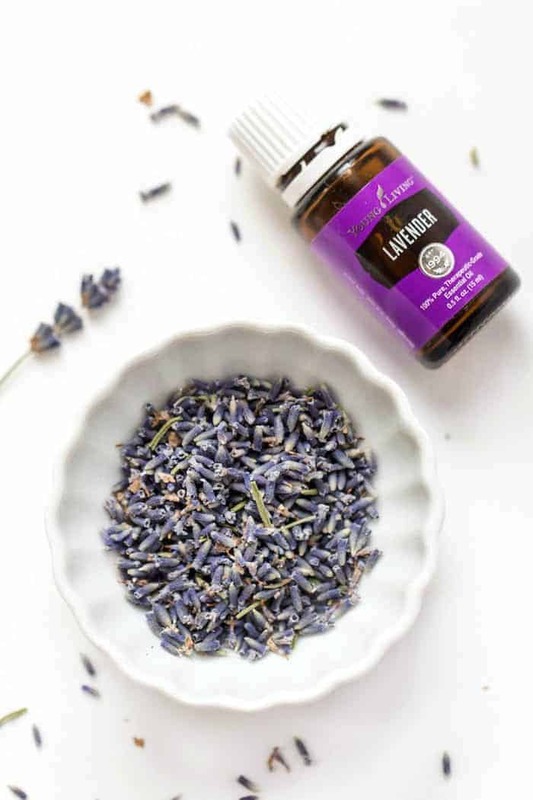 It's always in my nighttime blend, but I also use it while I'm working because lavender can help improve focus and mental clarity. I don't often diffuse lavender alone, but you absolutely can. It will make your room smell amazing and will make you feel all sorts of zen. Another way to use essential oils is topically. Just keep in mind that when you do use oils topically (on your skin), they need to be therapeutical grade. Most oils you find at a health food store, like Whole Foods, aren't therapeutic grade and aren't technically supposed to be used on the skin. An easy way to use oils topically is to create your own roller bottle blends. You add your preferred blend of oils, add a carrier oil (like coconut, sweet almond, grapeseed, etc.) and then you can take this little bottle with you on the go. My “wind down blend” is what I use when I'm tucking in for the night and need to just chill. It's a mixture of lavender and rosemary and it smells amazing. I keep it in the living room and rub it on my wrists and behind my ears when we settle in after dinner. It's the perfect trigger for my mind to let go of all my to-dos and really just relax and rest. Add all the ingredients into your roller bottle, seal it up and use it on pressure points! My next favorite way to use lavender is by making your own homemade room/pillow/linen spray. 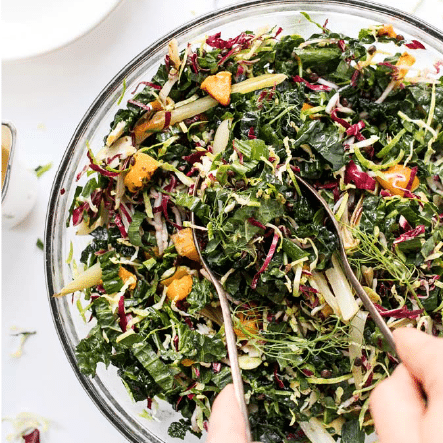 It's super simple (only 4 ingredients) and is such a great thing to have around your house. Spraying lavender on my pillow at night is one of my parts of my nighttime routine. It promotes relaxation, gets my mind into the sleep zone and it smells amazing. But since lavender can also be used as for focus, I always make sure to keep a bottle of this next to my desk. Just a few sprays and I feel like I can get back to work! Pour the witch hazel, water and lavender into the bottle. Add a few sprigs of fresh lavender if you have it, but that's totally optional. Screw on the top and then give it a little shake to make sure everything is incorporated. You'll want to also shake it every time you use it. We've talked about using baths as a way to show yourself some love and I have to say, a bath is one of the best ways to relax. 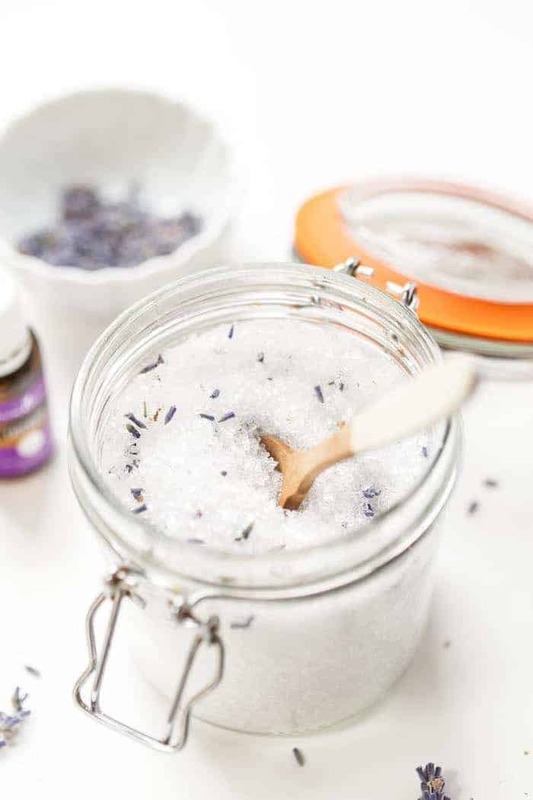 While we could spend money on bubble baths and/or bath salts, they're actually surprisingly easy to make at home! 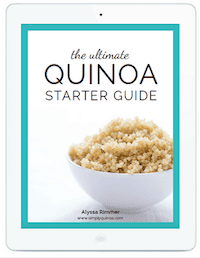 You just need Epsom salt and lavender and you're good to go! Epsom salt actually isn't a salt at all but is a pure mineral compound of magnesium and sulfate. Epsom salt eases tension and stress, relieves muscle pain and cramps, can also relieve constipation and helps eliminate toxins. Stir everything together in a bowl or jar and store them in a sealed container in your bathroom. For each bath, I use at least one cup! 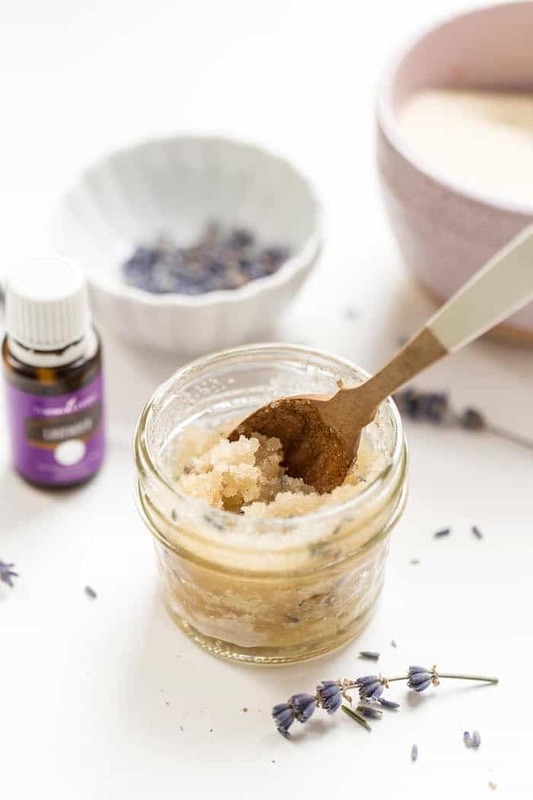 Our final ways to use lavender, and one of my personal favorites, is to make our own sugar scrub. Sugar scrubs are one of those things that again you could spend a lot of money on but are simple and cost effective to make. You just need a few simple ingredients and I bet you already have most of them in your cupboard! Stir everything together in a small jar and store in the shower. Use once or twice per week all over your body. When you're done showering, towel off and then moisturize immediately! 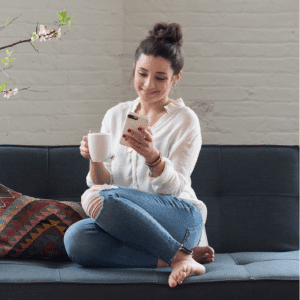 How to do you use essential oils? 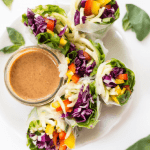 Let me know in the comments below ♡ hope you find these recipes as relaxing as I have! I don’t! 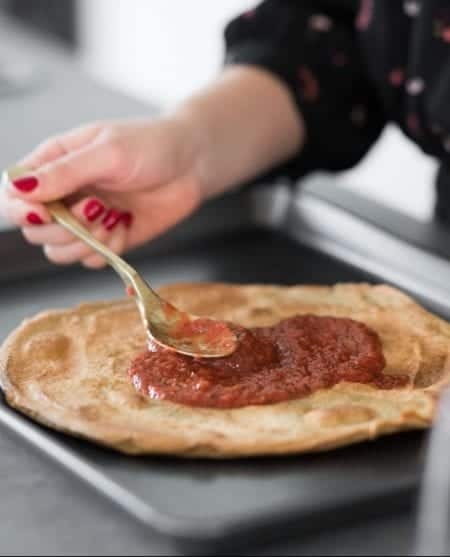 But they are VERY easy to make at home!